Nick Barmby was a side midfielder or winger who could also play as offensive midfielder and later as central midfielder. Barmby started his career at Tottenham Hotspur in 1992. He then played one season and a half for Middlesbrough between 1995 and 1997 before joining Everton where he stayed until 2000 when he joined Everton's enemy Liverpool. He won a with the reds UEFA Cup, FA Cup and League Cup but a knee injury wasted his career. He left Liverpool in 2002 and played for Leeds United and Nottingham before joining Hull City where he played from 2004 to 2012. 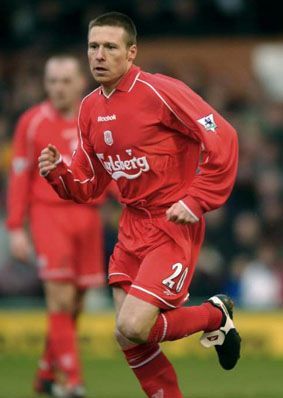 Barmby was a fast player with good dribbling, shot and heading ability despite being of small size. He mostly played as midfielder but his offensive tendencies led him score 24 goals for Everton and 8 for Liverpool and a total of 101 in his career. Barmby also won 23 caps for England scoring 4 goals and he was part of the team that reached the third place at UEFA Euro 1996.
https://www.dailymotion.com/video/x5ye10a Barmby's goals at Liverpool.